...MetOp-B weather satellite is undergoing its checkout in preparation for a May 23rd. liftoff from Kazakhstan’s Baikonur Cosmodrome on the Arianespace affiliate company’s 25th commercial mission. Built by Russia’s Lavochkin Research and Production Association, the Fregat M stage is an autonomous and highly flexible orbital vehicle that can be restarted as many as 20 times during flight, enabling it to carry out complex mission profiles. 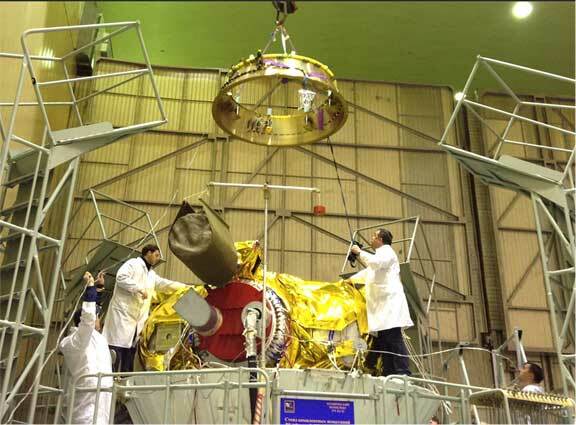 In preparation activity at Baikonur Cosmodrome, the Fregat M upper stage undergoes a fit-check with the adapter on which MetOp-B will be installed for this European weather satellite’s Soyuz launch on May 23. For Starsem’s upcoming flight, Fregat will place MetOp-B into polar orbit, joining the nearly identical MetOp-A spacecraft, which was launched in October 2006 by Starsem on another Soyuz mission from Baikonur Cosmodrome. A total of three MetOp-series spacecraft are being developed as a joint undertaking between the European Space Agency and EUMETSAT (the European Organisation for the Exploitation of Meteorological Satellites), providing continuous weather observations until 2020. The upcoming Starsem launch will use a Soyuz 2 modernized version of Russia’s medium-lift workhorse launcher, which also is in service with Arianespace at the Spaceport in French Guiana.